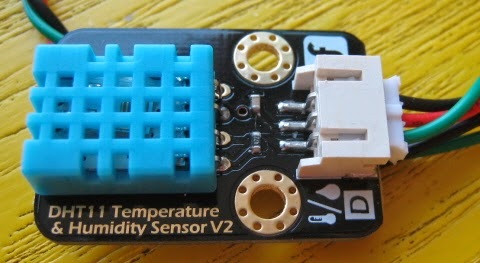 I have purchased DHT11 Humidity & Temperature Sensor from the following site. They deliver only the sensor. It has Connector and Wire; however, there is no PCB. 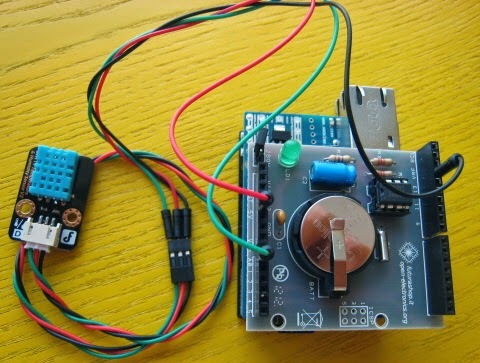 BUT, it doesn't have cable to connect to Arduino. Using the correct colors ( it's not a must ), connect it to Arduino. I attached it to Connector on RTC Shield. Red cable: +5V Power. Top left connector, fifth pin from the top. Black cable: GND. Bottom left connector, first pin from the top. Green cable: A0. Top right connector, fourth pin from the top. Download library and import it. Sensor value is int. There is no decimal values. Sensor value is float. There is decimal values. We are using this one. Temperature: It was very hot today; however, it looks somewhat correct. When I get an actual thermometer I will re-check. Humidity: Humidity calculation is based on Temperature, thus if the temperature is not correct humidity cannot be correct. Although there is a decimal point, the decimal value is always 0. If we change to better sensor I assume it will give us the decimal values so I'm going to stick with the float. Accuracy of sensor is not the point in this posting so I'm going to move on. chk = DHT.read11(DHT11_PIN); to int chk = DHT.read11(DHT11_PIN);. 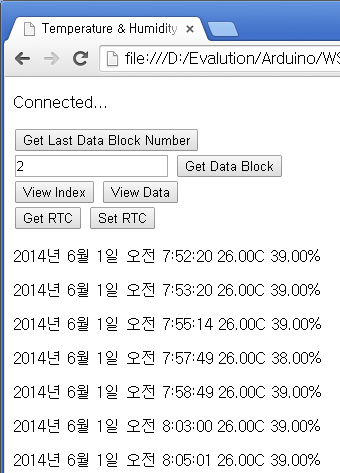 I have modified Get Data Block "GETn". We are going to send time stamp, temperature, and humidity all at the same time. Following is excerpts from the code. The entire code can be found in the link at the very bottom. I modified WSAdam5.ino to create the following code. // If you set it to this, it will read sensor value every minute. // It takes forever to debug if you set it to 10 minutes. This code shows how to upload data using Web Socket, and how to create Web DB using the uploaded data. Codes below are only part of the code. If you want to see the entire code look at the link at the very bottom. This code is modified from WSAdam6_5.html. 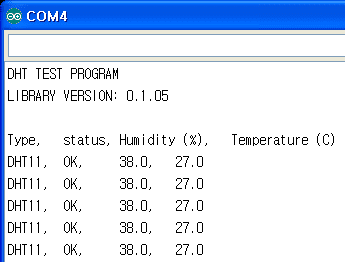 Clicking [GetDataBlock] button will display the Temperature & Humidity Data in DB.